Newman’s Own Organics for the furballs in your life. My dog, Karma, is a very special girl. 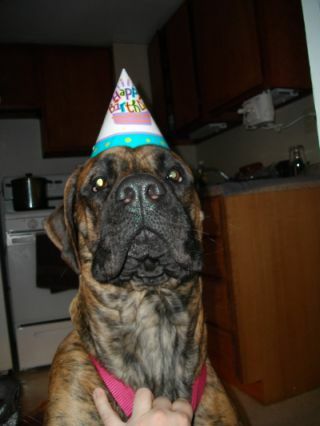 Karma is a 3 1/2 year old American Mastiff that was born with a serious heart condition. At first the Veterinarians thought she just had a minor heart murmur, but after a visit to the doggie cardiologist all hope had vanished. She was basically diagnosed with heart failure because of how bad the condition of her heart was. Karma was given no more than 9 months to live; the doc’s all figured her heart would give out before she made it to her first birthday. My heart was broken. Just two months earlier, my very best friend and first dog, Buster, had passed away from a stroke. He was only 5 years old and not a single person could tell me why he seemed to age so fast. So here I was, trembling from the thought of having to go through this all over again. Everyone told me to just have her *bleep* (I can’t bear to say that awful word) but I wasn’t going to give up on her. Most dogs, let me rephrase that, ALL dogs are allergic to wheat, corn, and soy products. If that’s the case then why do “big brand” dog food companies list wheat, corn, or soy as one of the first ingredients on their labels? Because the FDA and AAFCO only make sure that all the ingredients are labeled on all dog food products. They do NOT pay attention to the source or safety of the ingredients thrown into most dog foods. So what are you feeding your dogs? Probably a form of wheat, corn, or soy, and by-products, beef, artificial coloring, animal digest, bone meal, salt, sweeteners, and a ton of preservatives among many other unnecessary ingredients. Wheat, Corn, or Soy- Like I said before, a major allergen for ALL dogs. By-products- Consists of the dry, ground, rendered, clean parts of the carcass of slaughtered chicken, such as necks, feet, undeveloped eggs, and intestines. Animal Digest- Undecomposed animal tissue. The animal tissues used are usually hair, horns, teeth, hooves and feathers. Beef- Dogs have just as much of an issue digesting beef as we humans do. Animal meal- Such as Chicken, beef, bone, etc. The rendered tissues, including bone, blood, hair, hoof, horn, hide trimmings, manure, stomach and rumen contents. Now let me ask you this, would you feed that to a member of your family? What I’m getting at here is that I was slowly killing my own dog, Buster, by feeding him that crap on a regular basis. As soon as I got word that Karma only had so long to live, I made it my mission to keep her as healthy and happy as possible. 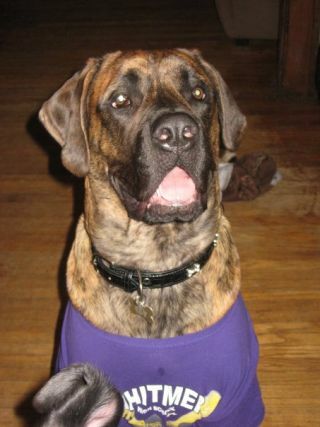 I switched to an all organic dog food which possibly prolonged the life of my very fragile Mastiff. Karma is now 3 1/2 years old and still going strong. She plays like she’s a ginormous puppy frolicking in her own little bubble thanks to companies like Newman’s Own Organics. Newman’s Own Organics dog food ingredients consist of natural human grade chicken, organic brown rice, carrots, peas, and is free of herbicides, antibiotics, hormones, pesticides, and chemical additives. Newman’s Own Organics dog food also has no wheat or corn products, artificial colors or flavor enhancers and is preserved with vitamin E. They also offer an array of wet dog food and organic dog treats as well. Wouldn’t you feel so much better feeding your pet Newman’s Own Organics instead of “big brand” dog food? I do and our dogs are much healthier because of the choices I have made regarding their food. Newman’s Own Organics dog food gives your dog the nutrition he needs without all the added, should I say, crap? When you switch your dog to Newman’s Own Organics you will not only notice a difference in appearance but in their physical abilities as well. Newman’s Own Organics will have your dog running circles around other dogs because of the much better energy, strength, and agility levels obtained from their all organic dog food; All the while being as handsome as ever with his shiny coat and healthy smile. I could honestly sit here and lecture you all day about making the right food choices for your pet but why do that when you can find out for yourself? Newman’s Own Organics dog food is obviously a little pricier then regular old dog food because of the human-grade qualities it has; however, their food runs a little cheaper (price not quality) then most holistic and organic brands. I can’t tell you how important it is to make the switch to Newman’s Own Organics. You’ll increase your dogs life span as well as cut back on Vet visits and unnecessary health issues. Our dogs love Newman’s Own Organics and I’m positive your dogs will, too. Connect with Newman’s Own Organics on Facebook to stay up to date on products and promotions. Also, enter below via Rafflecopter for a chance to win a prize pack for either your cat or dog. The picture below is Buster. Wasn’t he cute? Sesame Street Live is coming to Detroit! I love their products! I feed this to my dog, but my silly cats won't touch the stuff! Strange creatures though they are! Fun review! 🙂 Unfortunately I don't own any pets, so I can't vouch for my personal interest in the product, but it was fun to read about! 🙂 I learned something new! Your babies are so cute! Awesome review. Thanks! Our dogs are definitely part of the family. What a cute doggy! I have a mini wiener named Doug he is my whole world! Last time I tried to feed him organic food it made him really sick so we switched back to purina but I'd be willing to give it a try again because I really like the idea of giving him something that will be healthier. Really? Our pitbulls have terrible stomach problems on food that isn't organic and super stinky stomach problems at that. YUCK! Did you try switching him over really slow? Usually when you switch a dog to organic the process is a lot easier and faster then switching between non-organic dog foods. Your dogs are adorable! I think its wonderful that they made organic foods for dogs. Seems like this is the suitable product for your dogs. I need to try this for my fur babies! I wish they had a puppy formula, so I could switch both dogs over. Great products, great pictures, and great information!! Thanks. Your dog is so cute and i love that you are so proactive with his health. I feed my cat science diet, and while it's not the best its all i can afford right now and the ingredients are a hell of a lot better. I would love to try out NOO's cat food. Thank you for this lovely & informative review! Your dogs are cute! Its so important to give good food to them! Thank you for the great review I need to try this for my babies! Love those puppies! I have 1 cat and 2 dogs! my dogs do not have sensitive tummy's at all…but I bet they would like this! I love that they make pet food! Their human food products are wonderful!! Your pups are soooo cute! I didn't know they made pet food! We have one dog whose name is Scout. He's a border collie – beagle mix. I would love to try Newman Organic Pet Food and give it to Logan the ever active boxer. we are blessed with 4 furbabies–The Boss(Gizzy) a chaweiner, The Daddy(Stud) a shelty, Two rescue Pitbulls( Precious-a rednose-mama) and (Mr Hannubull-a blue Razorback–mentally retard)They are all the sweeties bunch you could ever want–non by my choice-but loved as much as our kids, they are better than some family members. I have a super adorable cat named Toby. She's 5 years old. She loves people, food, thunderstorms, and her carrier. Yes, she loves going in her carrier. She comes running over when I take it out. She loves to ride in the car, but she doesn't much like it if she ends up at the vet. I have 3 rescue dogs and one 3-pawed cat..they're all crazy and I always say the oldest has more issues than Time magazine but I love all of them beyond measure. I have 6 cats and two dogs. All are rescues, including one that is a belguim malinois, that is a retired narcotics dog. Of the cats, one is 21 years old, I have had her since she was 2 weeks old. Three are siamese, that are 14, all from the same litter. One was so abused it took her 5 years before she would sit on my lap. Now, she loves everyone, even the dogs. I have 4 dogs and one cat. My cat Sam thinks he is a dog. My dogs Patches and Lady are shelter babies and Cleo and Fudge were left under our car in a snow storm. I can't even imagine what a day would be like without my babies. I have 2 Cat's..Buddy and Sully. My Puppy is my best firend, she is so licky this looks great for her. I have 3 FIV+ adopted boys that I completely adore. Simon, Andybelle, and Oliver.